Celebrate the great outdoors with spring accessories made in the USA. It’s that time of year where you dust off the cobwebs of winter, come out of hibernation, and really enjoy life! From growing gardens to watching birds, it’s time to prepare for the abundance that spring has to offer. Do you love to play in the dirt and watch something grow? If you enjoy growing your own plants, herbs are a great addition to any garden! Now, it is easier than ever to grow your dill, basil, parsley and other herbs inside or outside with our PLANT Herb Seed Kit. Find a windowsill or a space outside to create your own special herb garden. 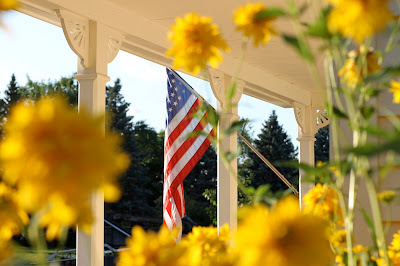 If you decide to keep your garden outdoors, make sure that you complete it with our USA Garden Flag & Holder. Are you looking for a unique housewarming or hostess gift? Basil is one of the most popular herbs used in cooking. Our Basil Wine Bottle Planter provides a unique gift for any cook who loves using fresh Basil in their dishes. Not only is this gift great for growing, it is also made out of a repurposed wine bottle–keeping it out of the landfills. If you love birds, you won’t want to miss out on our Soda Bottle Bird Feeder. This unique design transforms a soda bottle into an instant bird feeder. Be sure to also grab an Original Audubon Bird Call to attract birds to your yard. The entire family will become avid bird watchers! Of course we can’t forget the kids, right? Whether you are seeking a fun gift for your own kids or someone else’s, you will absolutely be a hit with the Hand-Crafted Round Wooden Swing! Keep them entertained and enjoying the outdoors for hours. So from our family to yours, Happy Spring! Are there other products that you would add to this list? Share with us in the comments!